I took my lunch really late on Thursday because of a weird morning schedule at work, but then didn't feel like eating anything. I started feeling ill. Then it got worse, and then it got horrible and I wanted to die. I took off work Friday and spent the next several days alternating between sleeping and vomiting. So to recap, I wrote about how I was so excited to be back to a routine and then immediately proceeded to get violently ill. My best guess is food poisoning, maybe made worse by little/no sleep, but I can't even think what could have caused it. Whatever, I'm glad it's over. 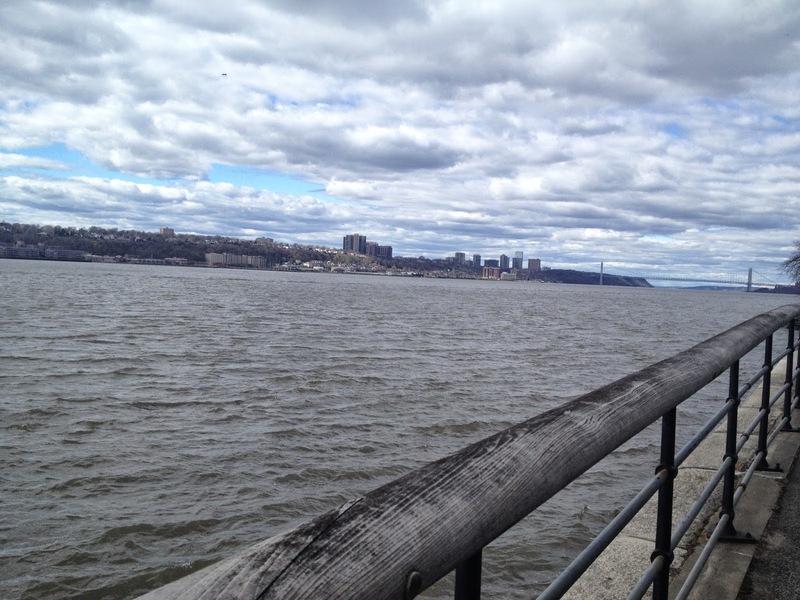 Yesterday, J and I took a long walk along the Hudson River Greenway, which is a beautiful biking/walking pathway along the Manhattan side of the Hudson River. I was giddy at the wonderful weather and also because I hadn't been outside since Thursday. In the midst of the fun jogger/biker/walker watching, we saw a girl taking multiple selfies while riding on the back of a tandem bicycle. She was not pedaling, but was adjusting her hair for the photos and giving the peace sign. I love people with no selfie shame. It felt odd to take a photo of a selfie, so here is the pretty view. I'm assuming the numbers this week will be skewed from being sick and eating very little for a few days, so I'm (again) kind of writing off this week of measurements. However, I'm still recording all the weights, and I'm definitely not writing off the week itself. Now is finally back to normal, and I will continue the progress I had finally started to make. My goals for the week are just to get back into the habits - working out, tracking, making and bringing lunches. The 3.5-mile walk yesterday was a good start, but I will be getting back into the gym tonight.